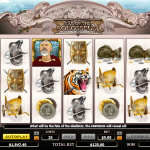 Call of the Colosseum is a video slot game from Nextgen Gaming that takes us on a trip to ancient Rome. This popular landmark is once again used like in the past for wild animal hunts and gladiator fights. The sound effects are powerful and they complement the theme in the right way. 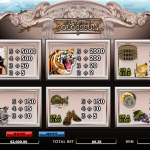 Call of the Colosseum has couple of special symbol that will make your experience more exciting. The emperor is the wild symbol in this game and it appears on the second, third and the fourth reel. Its function is to stand in for every other symbol to complete a winning line. The only symbol it cannot substitute is the scatter. The scarred shield symbol represents the scatter and it is the key to the main feature which is the free spins round. If you land 3 or more scatter symbols you will activate the free spins. Initially you will receive 10 free spins and all the wins will be a subject to a x 2 multiplier. Another great thing about this game is that every time the emperor appears he will give you a “thumbs up” or “thumbs down”. Every time you receive a “thumbs up” you will get between 1 and 3 free spins. Call of the Colosseum is one powerful game. Nextgen Gaming knew that if they use the Roman Empire as an inspiration they will come up with a successful game. But it is not only the beautiful design that lures us to this game. We also appreciate the fact that you can always activate the free spins even if you are playing on minimum bet on pay line. This is one interesting game that is worth the try, and we highly advise you to do so. For an adventure taking place in the wild west consider playing California Gold a 5 reel slot by NextGen.